Not that long ago, Facebook CEO Mark Zuckerberg refused to admit the social network needed to worry about the rise of "fake news," saying the suggestion that it might have influenced the U.S. election was "a pretty crazy idea." On Thursday, Facebook released a report that effectively admits the social network has been used by both governments and non-state agents as part of a series of orchestrated attempts to manipulate public opinion about political issues, including the U.S. election. Some of this has taken the form of artificially created "fake news" stories, as well as organized efforts to promote these stories and get them circulating as widely as possible. In particular, the Facebook security team says it found evidence of a coordinated effort using fake Facebook accounts to spread a variety of information related to the U.S. election, including reports based on emails that were stolen from Democratic Party headquarters. After the fake accounts promoted these stories, "organic proliferation of the messaging and data through authentic peer groups and networks was inevitable," Facebook said. U.S intelligence sources have tied this kind of activity to Russian agents acting on behalf of the government and other state entities in an attempt to influence the election, and Facebook's report said that the security team's information "does not contradict" this conclusion. Facebook's security team says as a result of its research, it has expanded its focus away from traditional forms of abuse such as spam or malware, and will now pay attention to "more subtle and insidious forms of misuse, including attempts to manipulate civic discourse." So now that the giant social network has admitted that this kind of behavior is a problem, what does it plan to do about it? That's where the hard part comes in. The company says that it will suspend or delete accounts that are trying to engage in this kind of activity, after it identifies them using a combination of machine learning and the kind of threat analysis that many intelligence agencies use. The company said it has already shut down more than 30,000 fake accounts in advance of the French elections. But how will Facebook know for sure that the accounts it is targeting are actual malicious agents or affiliated with government entities, as opposed to just being normal Facebook users who happen to be sharing fake news or racist propaganda? That's not clear. The company described several types of behavior that it said were associated with these campaigns, including sending out friend requests using spoofed accounts with real names. These may be followed up with malware links, or used to map the networks of users who were seen as vulnerable to future hacking or social-engineering attempts. Other techniques include the use of coordinated “likes” coming from multiple fake accounts, in order to boost the visibility of a fake news story, as well as the creation and use of groups that spread propaganda mixed in with legitimate news stories. "The inauthentic nature of these social interactions obscures and impairs the space Facebook and other platforms aim to create for people to connect and communicate with one another," the report says. "In the long-term, these inauthentic networks and accounts may drown out valid stories and even deter some people from engaging at all." As with many of the other things Facebook does, the primary intent is to maintain what it sees as "authentic" forms of interaction. But finding the line between authentic and inauthentic may not be as easy as the company thinks. For example, some of the behavior described by the security team wasn't aimed at a specific political view. "We identified malicious actors on Facebook who, via inauthentic accounts, actively engaged across the political spectrum," the report says, "with the apparent intent of increasing tensions between supporters of these groups and fracturing their supportive base. "Flagging fake or spoofed accounts is one thing. But how do you differentiate between someone who is intentionally sowing political discord and someone who is just sharing fake news because it reinforces their existing biases? That's the world Facebook finds itself in now. An overwhelming majority of Trump voters approve of the job he is doing as president. Donald Trump is languishing in the polls as he approaches the 100-day mark in the White House, but a new survey released Thursday shows the president’s voters are still firmly in his corner. The overwhelming majority of Trump voters surveyed by the University of Virginia Center of Politics, 93 percent, approve of the job Trump is doing as president. Only 7 percent of voters who said they cast their ballot for Trump now disapprove of his performance, the poll shows. That sentiment — the idea that what some see as dysfunction in the White House is viewed by many Trump voters as disruptive action — was backed up by focus groups conducted this month by Bolger’s firm, Public Opinion Strategies. Trump’s backing among his voters isn’t absolute: While his overall approval rating in the poll is sky-high, more Trump voters are in the “somewhat approve” column (51 percent) than the “strongly disapprove" column (42 percent). And while some Trump voters are unnerved by elements of his nascent presidency, even those who crossed-over or supported him more reluctantly are still willing to give him a chance. The survey and study also explored the extent to which Trump voters were hesitant to express support for him during the campaign — or even now that he is president. More than a quarter of Trump voters, 27 percent, say they were reluctant to tell others they planned to vote for him last fall. And now that he is president, 15 percent still say they are reluctant to express support for him publicly. Bolger said the survey and focus groups suggest that reticence may help explain why Trump won some states where polls suggested Hillary Clinton was ahead. Trump voters are ready to give the president a Republican House in next year’s midterm elections, the poll shows: Only 2 percent say they plan to vote for the Democratic candidate in their congressional district, compared to 78 percent who would vote for the Republican. One-in-five Trump voters say they are undecided, including 53 percent of independent Trump voters and 37 percent of those who call themselves moderates. “For 88 percent of Trump voters to say the press is the enemy of the American people is to me a pretty amazing finding,” Bolger said. But Trump voters are also wary of the president’s chief mode of circumventing the media: Twitter. In the poll, 45 percent of Trump voters disapprove of his tweets — a finding backed up by focus group participants. “I voted for him. I like him. But he's got to stop tweeting, and he's got to stop making ignorant comments because it's not helping him with [Democrats], it's not helping get that unity,” said a female Trump voter in Columbus, Ohio. The study included a national survey of 1,000 self-identified Trump voters, conducted April 17-19, along with eight focus groups, conducted earlier this month in Pittsburgh, Columbus, Canton, Oak Creek and Houston. Angela Merkel addresses the Bundestag in Berlin. Marine Le Pen told supporters the “survival of France” was at stake in the second round of the presidential election in a jubilant speech at her rally in Hénin-Beaumont in France’s northern rust belt. The Front National president said the first step towards the Elysée had been taken and that it was time to “free the French people from the arrogant elites”. “I am the candidate of the people,” she told the cheering crowd. In a clear dig at her second-round rival Emmanuel Macron, Le Pen said: “Savage globalisations puts our civilization in danger … I am presenting a fundamental alternative.” She described her victory as historic and said she welcomed the result with “humility and gratitude” before standing with her key FN aides to sing La Marseillaise. As the result came through, Front National supporters in its Hénin-Beaumont heartland, where Le Pen is a municipal councillor, reacted with a roar and cheers of “Marine President”. Mikael Sala, FN secretary for the Val d’Oise department, north west of Paris, said Le Pen was “conquering”, adding: “Since I started campaigning for the FN, there has been a rolling wave of support that has grown. We are now just 15 days until she takes the reins to save this country. Many FN supporters, angry at a media they believe is against them, refused to speak to journalists, responding to requests with a curt “non”. It was only natural for Le Pen to turn her back on the metropolitan Paris elite she professes to despise and drive north for two hours to vote in the former coal mining town of Hénin-Beaumont in France’s northern rust belt. One of her top generals, Steeve Briois, is the local mayor and she has a second home nearby. She was the only one of the main five candidates to shun the French capital and its suburbs and her message to what she calls “Forgotten France” was loud and clear: “I have not abandoned you”. As voting opened in the fiercely contested presidential election, the town’s streets were deserted apart from clusters of journalists interviewing each other. Le Pen voted early, arriving in a blue trouser suit, kissing the electoral officer on the cheek, smiling broadly, but saying nothing. Outside, as Le Pen cast her vote, police clashed with a dozen bare-breasted Femen protesters, who had jumped out of an SUV wearing Donald Trump and Le Pen masks, with “Team Marine” written across their chests. The women were arrested and takento a nearby police station. The far-right populist party has been in power in Hénin-Beaumont for three years after seven decades of leftwing rule. The unemployment rate among its 27,000 population runs at 20%, twice the national average. The FN promised solutions, but the jobless rate has not fallen under the far-right administration. In the town centre, lots of bars are closed, shop windows are boarded up and many buildings, with their flaking and grimy facades, have seen better days. Only the large town hall and church, clad in scaffolding, are looking forward to better days. Hénin-Beaumont is in a once prosperous region of Pas-de-Calais, home to waves of migrants from Belgium, Italy, Poland and north Africa, where miners and factory workers have historically voted left. In recent years, the FN has made increasing inroads into such rural and post-industrial areas where the unemployed and those struggling to make ends meet feel abandoned by the main political parties. “There are a lot of problems here, that’s why people are voting for Marine Le Pen,” said Pascale, smoking a roll-up cigarette outside a local café. “I’m the daughter of a manual worker and, 30 years ago when I was 10, my father said voting for the Front National would spark the third world war. Today, the party is not the same and this isn’t the case. In the Tunisian restaurant on the town centre’s square, the waiter laughed when asked what he thought of Le Pen. “She’s a bit radical,” he said. Brios has tried to impose far-right solutions to local problems, but with little success. A supposed “wall against crime” ended up being a traffic control measure, a “zero-immigrants charter” fell flat because very few of the recent waves of migrants actually want to go to Hénin-Beaumont. A ban on begging was overruled by a judge. Dorothée Fizazi, the president of the charity Secours Populaire in the town, told French journalists that the reign of Briois’ had been catastrophic. Others are less negative. One local said Briois was trying to clean up the town and “not doing such a bad job”. French presidential candidate Emmanuel Macron delivers a speech in Paris after the first round vote. Emmanuel Macron has told ecstatic supporters in Paris that he intends to govern for all of France as he emerged from a first-round vote as the clear favourite to become the country’s next president. Appearing at a celebration rally in Porte de Versailles with his wife Brigitte after projections gave him a slender lead over Marine Le Pen on Sunday, Macron delivered a speech that, at times, sounded like he had won the vote outright. Macron, who styled himself as a liberal progressive outsider who would revolutionise politics, appealed to enough voters to get into the 7 May second round; early projections put him at the head of the field with about 24% of the vote – a success that has bucked the global trend towards protectionism and nationalism. At 39, Macron is by far the youngest person to ever have a chance at the French presidency and has risen to the fore despite never having stood in any kind of election before. He styled himself as a progressive maverick who was “neither left nor right”, economically liberal, pro-business but leftwing on social issues. He did not have the backing of a traditional political party, had no constituency or firm voter base and was a complete unknown four years ago. When presidential opponents questioned his standing and experience – as they were quick to do after the Champs-Elysées attack on police last week – he responded that France’s complacent, ineffective political class and the lacklustre political parties which have clung in power for decades had shown experience meant very little. He promised a “democratic revolution” against the “vacuous”, moribund French political system he felt voters had come to loathe. Macron’s critics for a long time called him a “champagne bubble” that would burst. A former investment banker in a country where voters distrusted banks, he had been appointed as economy minister by François Hollande. He quickly became the most popular minister. He also served as a presidential adviser in the gilded anti-chambers of the Elysée palace – effectively the architect of Hollande’s pro-market, business-friendly reforms that so alienated voters on the left. Macron’s presidential bid was a mass of contradictions, critics complained. He was a member of the elite top tier of the civil service, on friendly terms with business leaders and powerbrokers, yet vowed to fight the “system”. He believed in always smiling and being optimistic, offering what he called “hope and courage in the face of resignation”, yet he was seeking election in one of the most pessimistic countries in the world, where people were exhausted by decades of mass unemployment and repeated terror attacks. He championed free market globalisation, international trade deals and the European Union at a time when fear for the future meant protectionism and Euroscepticism were gaining ground. Macron’s central message was that he was a modern, digitally-minded, international progressive who could make the centre fashionable again, bucking the global trend for a return to nationalism and extremes. It was hard walking a centrist tightrope, pleasing both left and right. He promised better democratic accountability yet said he would spend his first summer pushing through labour reforms by presidential decree. There was not a catchy, headline manifesto pledge that immediately stood out in voters’ minds but there was a set of what he called pragmatic plans: streamlining the pension system, expanding unemployment benefits but better controlling them, freeing a majority of households from housing tax and cutting charges and red tape for businesses. He said he wanted a more inclusive society and described France’s colonial past in Algeria as a “crime against humanity”, before tempering the statement. Sitting in his shirt sleeves, eating ready meal lunches in the airless meeting rooms where he organised the first phase of his campaign, Macron would confide to visitors that the French political system was long broken and that he intended to build something new in its place – with more women and more people from civil society in parliament seats. The political movement, En Marche!, was free to join online and swiftly exceeded membership of Hollande’s ruling Socialist party. It promoted meetings in bistros and cafés where members could thrash out manifesto ideas, having their say in his project. But what stood out was how much Macron’s presidential campaign was centred on his own persona. He gave the movement his own initials. There was no campaign director and few recognisable spokespeople – instead the spotlight and decision-making fell firmly on him. On stage at rock star-style stadium gigs, he smiled and raise his outstretched arms to the sky. He called politics “mystic”. He believes that ever since king Louis XVI’s head was chopped off in the revolution, France has been constantly trying to compensate for the lack of a true leader figure who could personify France. The postwar president General de Gaulle fitted the bill, he had argued but, since then, the increasingly “ordinary” characters who served as French president had left a kind of “empty seat at the heart of political life”. Macron boldly presented himself as the young face who could embody the nation. The question is whether Macron has understood the pessimism in France and its causes and whether he can address them. He argues that he has. Some say Macron’s rise has been down to luck and circumstance. Hollande’s decision not to run again for office and the defeat of the moderate Alain Juppé in the right’s primary race last autumn opened up the centre ground. When the rightwing favourite François Fillon was hit by scandal, it allowed Macron to overtake him in the polls. When the left-winger Benoît Hamon won the Socialist ticket, Macron could take a chunk of the centre left. Macron’s team argue that he made his own luck. Far from a technocrat who suddenly saw a chance for power, Macron has been thinking about and strategising a political role for himself for a long time. Marine Le Pen, left, leader of the Front National, will face independent centrist Emmanuel Macron in the final round of the French presidential election. The independent centrist Emmanuel Macron has topped the first round of the French presidential election and according to projections will face the far-right Front National’s Marine Le Pen in a standoff marked by anti-establishment anger that knocked France’s traditional political parties out of the race. Macron, 39, a political novice, now becomes the favourite to be elected as France’s next president. He is the youngest ever French presidential hopeful and has never run for election before. After the UK’s vote to leave the European Union and the US vote for the political novice Donald Trump as president, the French presidential race is the latest election to shake up establishment politics by kicking out the figures that stood for the status quo. The historic first-round result marked the rejection of the ruling political class – it was the first time since the postwar period that the traditional left and right ruling parties were both ejected from the race in the first round. France’s two political outsiders – the progressive, pro-business and socially liberal Macron and the anti-immigration, anti-EU, far-right Le Pen – will now face off in a final round on 7 May that will redraw French politics and could define the future direction of Europe. The Socialist prime minister Bernard Cazeneuve led appeals from across the political spectrum to support Macron in order to block Le Pen, who he said represented “regression and division” for France. The scandal-hit rightwing candidate François Fillon, who was knocked out of the race, said he would also vote for Macron because the Front National “has a history known for its violence and intolerance” and its economic and social programme would lead France to bankruptcy. Macron, a former investment banker, who had been a chief adviser and then economy minister to the Socialist François Hollande, is not a member of any political party. He quit government last year and launched his own political movement, En Marche! (on the move), that was “neither left nor right”, promising to “revolutionise” what he called France’s vacuous and decaying political system. Speaking in front of an ecstatic and raucous crowd in Paris, Macron said of his fledgling political movement: “In one year we have changed the face of French political life.” He said he represented “optimism and hope”. In a dig at Le Pen, he said he would be a president of “patriots” against the “nationalist threat”. Le Pen’s place in the final round cements her party’s steady rise in French politics. The Front National has made steady gains in every election since she took over the leadership from her father, Jean-Marie Le Pen, in 2011. Le Pen ran a hardline campaign against immigration and promised to crack down on what she called “Islamic fundamentalism”. While Macron’s supporters at rallies waved EU flags and he hailed the positive role of the 27-country bloc, Le Pen told supporters “the EU will die”. She wants to leave the euro, return to the franc, exit the Schengen agreement and close French borders. The central message of Marine Le Pen’s campaign was the staple of the Front National party since it was co-founded by her father in 1972: keeping France for the French. Le Pen promised to give priority to French people over non-nationals in jobs, housing and welfare, and would hold a referendum to cement this policy into the constitution. She said she would demand extra tax from companies that employed any kind of foreign worker. In the final days of the first round campaign, she returned firmly to the main concern of her electorate: immigration. She went further than she had done before by promising to immediately suspend all legal immigration in order to reassess what she called the “uncontrollable situation” of foreigners coming into France. She promised a ban on religious symbols, including the Muslim headscarf, from all public places. Both the rightwing Les Républicains party and the ruling leftwing Socialists, which have dominated government and French politics for decades, were knocked out of the race. They managed to take only around 25% of the vote between them. Le Pen, who has no natural alliances with other parties – crucial for winning the second round – issued a call for all “patriots” to join her. Fillon, a former prime minister who was once favourite, was knocked out after his campaign was hit by allegations that he embezzled state funds by giving his wife and children generous, taxpayer-funded “fake jobs” as parliamentary assistants over the course of his long political career. He said he took full responsibility for his failure, but continued to hint that the corruption allegations were not his fault but a plot against him, saying he lost the presidential race because “the obstacles put in my way were too many and too cruel”. As the count continued on Sunday night, Fillon was tied in third place with the hard-left Jean-Luc Mélenchon, leader of a grassroots movement, La France Insoumise or Untamed France, which had the backing of the Communist party. Mélenchon’s support had surged in the final weeks. The Socialist Benoît Hamon, who came in fourth place with a very low one-figure score, said he had failed in stopping the “disaster” that had been clear in advance. He said the elimination of the left by the far-right for the second time in 15 years – following Jean-Marie Le Pen’s second-round presence in 2002 – showed a “moral defeat” for the left. He appealed for voters to choose Macron to block Le Pen, who he called an “enemy of the Republic”. Whoever wins the Macron-Le Pen race, the parliamentary elections that follow in June will be crucial. The majority in the lower house will determine how a new president could govern, and France is likely to require a new form of coalition politics. If elected president, Macron, fielding MP candidates from his fledgling movement, would have to seek a new kind of parliamentary majority across the centre left-right divide. If Le Pen did win the presidency, she would very probably not win a parliament majority, thwarting her ability to govern. But her party hopes to increase its MPs in the 577-seat house. Currently Le Pen has only two MPs. The French election race had been an extraordinary run of twists and turns. The Socialist François Hollande became the first president since the war to decide not to run again for office after slumping to record unpopularity with a satisfaction rating of only 4%. His troubled five-year term left France still struggling with mass unemployment, a sluggish economy and a mood of disillusionment with the political class. The country is more divided than ever before. More than 230 people have been killed in terrorist attacks in little more than two years, as the political class questions Islam’s place in French society, and more than 3 million people are unemployed. The election race itself was marked by a series of poll upsets. For over a year, the moderate centre-right Alain Juppé was seen as a presidential favourite but he was knocked out of the right’s primary race, alongside the former president Nicolas Sarkozy. Similarly the centre-left prime minister Manuel Valls was beaten in a Socialist primary race by the backbench rebel Hamon. France goes to the polls on Sunday with terrorist violence casting a long shadow over its fraught presidential election, after the shooting of a policeman on the Champs Élysées deepened already bitter political divisions. Candidates with radically opposing visions for the country’s future clashed openly over the response to the killing, claimed by Islamic State less than 72 hours before polling stations open. The frontrunner, Emmanuel Macron, accused his two closest rivals of using the killing of Xavier Jugelé, 37, and the serious wounding of two other police officers on Thursday night to score political points before Sunday’s first-round vote. Macron suggested the far-right Front National leader, Marine Le Pen, with whom he is neck-and-neck in polling for the first-round vote, and the rightwing candidate François Fillon – currently in third place – were engaging in one-upmanship in their response to the attack. Hardline statements from Le Pen and Fillon spoke of a country “at war” with radical Islam, which they described as organised, expansionist, totalitarian and barbaric. The gunman, identified by prosecutors on Friday as Karim Cheurfi, 39, had a long record of violence against police including two attempted murders. Shot dead as he attempted to flee the scene after firing on a police van with an automatic rifle, he was reportedly under surveillance by intelligence services but was not flagged as a potential jihadi threat. The US president, Donald Trump, offered a tacit endorsement of LePen, describing her as the “strongest” candidate. Campaigning for the first round ends at midnight on Friday and polls suggest any two of four leading candidates could go through to the runoff on 7 May. The French prime minister, Bernard Cazeneuve, said the government had reviewed its extensive election security measures and was fully mobilised in the wake of the attack. He appealed for national unity and for people “not to succumb to fear”. Cazeneuve said more than 50,000 police and gendarmes and 7,000 soldiers would be on duty for Sunday’s first-round vote in the two-stage election, and nothing could be allowed to “hamper this democratic moment”. Macron, a former investment banker and economy minister running as an independent centrist, said in response to the attack that it was vital for people to summon a “spirit of responsibility in what is an extreme period” and come up with a measured response to “a tragic event that has left our country in grief”. He accused Le Pen of lying when she claimed she could have prevented previous attacks if she had been in office. “She won’t be able to protect our citizens,” Macron said. Le Pen, widely seen as taking the hardest line on security, had earlier taken a characteristically tough stance against Islamic extremism, branding it a “barbaric and monstrous totalitarian ideology” and insisting France immediately take back control of its borders from the European Union. She said France must engage in a “war against terrorism” and accused successive French governments of being too lax towards fundamentalists. She demanded the immediate expulsion of foreigners linked to Islamism and flagged as suspects considered a potential risk to national security. Those with joint nationality should be stripped of their French citizenship and expelled to their country of origin, she said. “This war is asymmetric and revolutionary. It is a war in which all the population, all the country is targeted. It is obviously a war we cannot lose,” Le Pen told journalists. Like Le Pen and Macron, Fillon, the rightwing candidate whose campaign has been hit by allegations he paid his wife, Penelope, public money for parliamentary assistance she did not provide, cancelled planned end-of-campaign meetings on Friday. He said France must show it was united, and not afraid. For years “I have been warning that we are confronting an Islamic totalitarianism, in other words, an ideology that is radical, organised and expansionist,” he said. Cazeneuve criticised Le Pen and Fillon’s reactions, claiming they were excessive and divisive. He said Le Pen “seeks, after each drama to exploit it to manipulate and divide in order to shamelessly exploit the fear and emotion for exclusively political ends”. The Champs Élysées reopened on Friday morning having been sealed off for much of Thursday night as police ordered tourists back into hotels and blocked people from approaching the scene. Emergency vehicles blocked access and metro stations were closed. France has been on its highest possible level of terror alert since the 2015 Charlie Hebdo and Paris attacks and the Nice truck attack of July 2016. Thousands of troops and armed police have been deployed to guard tourist hotspots such as the Champs Élysées. This week, two men were arrested in Marseille on suspicion of planning an attack before the election. A machine-gun, two handguns and 3kg of TATP explosive were found at a flat in the southern city, along with Isis propaganda material. Polls have suggested Le Pen and Macron are the most likely candidates to go through to the second-round runoff, but Fillon and the hard-left candidate Jean-Luc Mélenchon are only two or three points behind, and up to 25% of voters have yet to make up their minds, making the race impossible to call. Viktor Orbán, the Hungarian prime minister, votes in Budapest in last year’s referendum on the EU’s plans to resettle refugees. The possible closure of the Central European University in Budapest has unleashed waves of denunciations directed at the Hungarian prime minister, Viktor Orbán, in western media. Orbán has been accused of leading an “assault on freedom” in the New York Times, while one Guardian writer has summoned up the spectre of Munich 1938. Let’s go over a few facts many west of Vienna seem unable to understand. Hungary is a democracy. It has a wide range of political parties (a lot more than, say, the US, which is only one party away from being a one-party state). It has free and fair elections. It has a parliament that passes legislation. The quality of legislation can vary greatly, as in any democracy, but like most legal matters that is a matter of keen debate. If citizens are unhappy about the legislation, they hold demonstrations, as they have been doing. Orbán has aroused a lot of ire with his talk of “illiberal democracy”. I would like to underline the word democracy in that formula, which tends to get overlooked in the frothing of his critics. It should also be noted that in current Hungarian political usage “liberal” doesn’t have the connotations of “civilised”, “enlightened” or “generous”, it’s a portmanteau for leftwing conventions. I accept that an anti-left stance isn’t going to win Orbán fans among the Guardian’s readers, but I trust they might be willing to accept that someone who has a different opinion isn’t automatically wearing jackboots. I find the criticism that Hungary no longer has a pluralistic media especially puzzling. That’s a harsh judgment on a country: the sort of judgment that requires evidence. I always find it interesting how people who don’t speak Hungarian feel entitled to accuse Orbán of “muzzling the press”. For the benefit of those who have no Hungarian, I can give you a long list of television, radio, print and internet outlets that are not only prepared to be critical of Orbán, but devote themselves exclusively to trashing him. Indeed some of the criticism and satire is of a savagery rarely seen in Britain – it has to be conceded there’s very little adult debate when it comes to politics in Hungary. If I want to know what’s going on in Hungary I check www.index.hu, which is fairly balanced, but enjoys needling the government. If I want some tabloid fun, I go to www.444.hu, which is unrepentantly anti-Orbán. Anyone with a phone can have access to “clean” news or denunciations of the prime minister if they want. Orbán has also been condemned for his treatment of migrants. Some see his detention of the people flooding in over the border as unreasonable. It might not be the ideal solution, but unlike the EU – which is sitting on its arse in bewilderment – Orbán is actually doing something. I am the son of refugees and I can assure you that if my parents had been detained when they arrived in Britain in 1956, in safety and with regular meals, while matters were sorted out, they wouldn’t have complained: they would have said “thank you”. The most disgusting accusation made against Orbán is that of antisemitism – as George Soros, the billionaire behind the Central European University, is Jewish. Orbán is the man who introduced Holocaust education into schools, passed a Holocaust denial law and whose government financed Son of Saul, a film about Auschwitz that won an Oscar. The amendment to the law on higher education that has caused the recent furore affects 28 foreign institutions in Hungary, 27 of which were found to be operating with “irregularities” (largely sloppy paperwork, something that will come as no surprise to anyone familiar with university admin). None has been fined or shut down. Many, probably most, academics at Hungarian universities disapprove of the amendment, which they feel is bad for research, but the Central European University is not being singled out for punishment: it’s asking to be given privileged treatment. This is not simply about freedom of speech or independence of scholarship. The CEU is legally a Hungarian university. Under the amendment the same buildings, the same canteen, the same umbrella stands, the same courses, the same bitching about Orbán and his wickedness can continue, and students can get a qualification recognised in Europe. The government can’t touch them. What can’t continue, without a new deal, is the practice whereby the CEU can also issue a diploma accredited in the US – it is registered in New York – without actually operating a campus. Until now, CEU students have been getting double bubble. Obviously that was an attractive deal for students so, should the CEU lose that option, it will make the university less marketable. However, if it is so much the centre of excellence that its supporters claim it is, it should still be able to attract students. The issue is bums on seats and dollars as much as anything else. I have followed the progress of this institution since its creation in 1991, and I know many of the staff. One of the salient themes it has been banging on about for nearly 30 years is the rule of law. Perhaps the CEU should adhere to its own principles and comply with the law. Then everyone can vote against Orbán next year. This week, the Danish-American actor once again delivered a speech meant to breathe courage into his flagging crew. But this time, his words were delivered in a somewhat gloomy internet video, and his enemy was not the Dark Lord and his hordes – it was the government of Argentina’s conservative president, Mauricio Macri. The 33-second clip – in which Mortensen describes Macri as a “neoliberal braggart” – has gone viral across Argentina, and cast a spotlight on an increasingly bitter row over rumoured changes to the way the country’s film industry is financed. Mortensen, who grew up in Argentina, took aim at Macri and his culture minister, Pablo Avelutto, over a draft “digital convergence” bill with which Macri’s government intends to update media legislation to cover online streaming entertainment. Details of the bill have not been released, prompting speculation that the new legislation could involve cuts to state funding for the country’s critically successful film industry. However, uncertainty over the new law – and Macri’s recent dismissal of Alejandro Cacetta, the head of the National Institute of Cinema and Visual Arts (Incaa) – have prompted actors and directors to warn that the future of Argentina’s film industry is at risk. About 100 films are made in Argentina each year, but the country punches above its weight on the international market and has won two Oscars for best foreign film. Film director Luis Puenzo, who won the 1985 Academy Award for best foreign film with The Official Story, said he was concerned by the secrecy surrounding the bill. “This government is very pro-business so it wouldn’t be surprising if they wished to ease the cost of licences for cable operators by slashing their contribution to the film fund,” Puenzo told the Guardian. When a hard rain falls on a city, it can turn quickly into an ecological disaster. That’s because in 775 mostly older cities where sanitary and storm water sewers are combined underground, the rushing stormwater often overwhelms treatment plants, forcing a stew of oil, brake dust, heavy metals, pet and human feces into nearby waterways. The resulting pollution can shut down beaches, enter the food chain and contaminate drinking supplies. The traditional and costly remedy for the problem of “combined sewer overflow” has been to build underground tunnels or sinks to capture the excess. In large cities, such as St. Louis, such projects can total close to $5 billion. But engineers are discovering greener and often cheaper ways to prevent water flowing into storm drains by recreating (and in some cases improving upon) the earth’s natural filtering system. Basically, these cities are becoming better sponges. These places include vegetated swales and bio-retention cells, fancy names for low tracts of land that collect and filter water, green streets and green roofs, rain gardens and rain barrels, bump-outs, infiltration galleries and pervious pavement. They are all designed to capture water and hold it until it until the water has either naturally percolated through the soil and been absorbed by plant roots or released into the atmosphere through the plants’ leaves, a process known as evapotranspiration. The beauty of an intensive investment in green infrastructure is that the impact goes well beyond curbing stormwater flow. Green roofs, road gullies, curbside bio-retention plots and swales planted with trees and flowers and designed to hold water while it seeps into the ground, not only clean the water, but provide carbon sequestration, which helps slow global warming and combat urban heat islands, where temperatures can be as much as 5 degrees higher than the surrounding countryside. Chicago — A 55-gallon rain barrel might not solve the world’s stormwater runoff problems, since a 1,000-square-foot roof delivers more than 10 times that much water from a 1-inch rain. But rain barrels are still a vital tool, which is why the city spent $6 million over two years to give away 123,000 rain barrels to its customers. “It’s the gateway drug into storm water management because it gets people thinking about water and thinking about managing water,” says Hunt at North Carolina State University. Fayetteville, N.C. — This eastern North Carolina city, home of Fort Bragg, took a dilapidated, two-block slice of downtown already slated for revitalization and turned it into the state’s first fully developed green street. A “road diet” eliminated three superfluous lanes, allowing a wider sidewalk and the creation of 13 sunken “landscape islands,” where water enters through a break in the curbing. The islands are filled with 3 feet of “expensive dirt mixed with sand and organic topsoil,” explains city engineer Giselle Rodriguez, who shepherded the project last year. Interlocking concrete pavers were put down in some parking areas, which also allow water to drain into the ground. Philadelphia — The nation’s fifth-largest city announced plans to spend $2.5 billion from 2011 to 2036 to turn 10,000 acres into green spaces. That includes one-third of the impervious areas in the older, urban core, which has a combined sewer and stormwater system. By doing so, the city hopes eventually to cut stormwater pollution in local rivers and waterways by 85 percent. But that’s not all. As part of its stormwater management program, the city helps subsidize residents who want to replace their water-shedding driveways and concrete patios, with porous pavers. Philadelphia is also one of the few municipalities with a separate stormwater fee based on the percentage of a property’s impervious surface. New developments the size of three townhouse lots or bigger are required to put systems in place that will guarantee the capture of the first inch of any stormwater runoff. An architectural sketch of the Drexel Town Square development in Oak Creek. Old parking lots were replaced with pervious pavers set on top of stone. After a rain, says Winnen, you can feel the water under the pavers as you walk on them. And a sloped parking lot sends that runoff into three bioswales on the opposite corner from the wetlands. The result: Despite a very wet spring, says Winnen, the amount of water flowing out of the entire development’s sole drainage pipe is the equivalent of a few garden hoses of water. Toronto — North America’s first green roof bylaw took effect in Toronto in 2010 for commercial and residential buildings that had more than 20,000 square feet of floor space. Depending on the size of the building, anywhere from 20 to 60 percent of the available roof space must become a green roof, outfitted with a waterproof membrane, a growing medium, and plants. By the end of 2016, some 400 green roofs had either been built or were in the permitting process, covering the equivalent of about 60 NFL football fields. Union members take part in a protest against the Greek government’s austerity reform program in Athens. It is “urgent” to reach an agreement on a loan program for Greece but a commitment is still required from Athens on reforms and from Europe on debt relief, a senior IMF official said on Friday. Talks between Greece, the International Monetary Fund and the eurozone have dragged on for many months. But Athens needs a fresh infusion of funds soon to make its debt payments due in July. Despite pressure from European heavyweight Germany, the IMF so far has refused to participate in the 86 billion euro loan program the eurozone agreed with Greece in mid-2015, the third since 2010, largely over the issue of the nation’s debt sustainability. Greece announced on Friday a budgetary surplus (excluding debt charges) of 3.9% of GDP in 2016, in line with targets. European Commissioner Pierre Moscovici welcomed the result. “This should contribute to the will for the steps that lie ahead to find a lasting and comprehensive solution,” he said on the sidelines of the IMF spring meeting. French Economy Minister Michel Sapin also was optimistic about a deal. “I am quite confident that we will find, with the IMF and Germany, a solution that will help Greece and thus the EU to stabilize the situation,” he said. Thomsen, however, said disagreements persist over the period of time in which Athens will have to meet the surplus objective, which the IMF considers too ambitious. The eurozone says Greece can deliver a primary surplus of 3.5% of in 2018 but the IMF has said only 1.5% is feasible. The IMF also needs more clarification from Europe on how it will implement the promised debt relief for Greece, he said. If these two issues are resolved, the IMF will be able to participate financially in the aid plan, as it did in 2010 and 2012, Thomsen said. IMF chief Christine Lagarde on Friday met with Greek finance minister Euclid Tsakalotos and she had “constructive” discussions, but did not provide further details. She has stressed the fund cannot participate in any loan program unless the debt level of the country is considered sustainable. The same groups that encouraged conservatives to buck the president on the last health care bill say they’re ready to see a deal. Deep-pocketed conservative groups that helped fuel the downfall of the House GOP’s Obamacare alternative are now quietly signaling they won’t oppose the White House’s renewed push to pass the bill. Some of the most influential — and usually loudest — groups have privately told conservatives they want to see a deal go through, according to several people familiar with the conversations. Two large and influential groups backed by the billionaire brothers Charles and David Koch have signaled to Freedom Caucus members that they hope to be able to support the bill and want to see the tide turned after an embarrassment for the Republican Party. While The Heritage Foundation hasn’t taken a position, its president, Jim DeMint, has told House members he would be more open to compromise this time around — so long as the compromise looks like ideas floated to conservatives over the past few days. The Club for Growth has also stepped in, running ads attacking moderates who might oppose a new White House deal. The shift marks a sea change for President Donald Trump and Republican leaders, who had to contend with the same outside groups calling the earlier bill “Obamacare lite” — a label that made it all but impossible for the most conservative House members, many of whom campaigned on Obamacare repeal, to support a deal. Warsaw wants asylum seekers to be housed in converted shipping containers. Poland is mulling setting up special camps where asylum seekers would be housed in containers and kept behind fences in the event of another migration crisis, according to the country’s interior minister. It’s a very similar approach to one adopted by Hungary, which has come under fire from the EU for its harsh approach to asylum seekers. The idea is popular politically. A recent survey by the CBOS organization found that 74 percent of Poles don’t want migrants from Africa or the Middle East in their country — among supporters of Law and Justice the figure was almost 90 percent. PiS pulled out of an agreement the previous government had made to relocate some 7,000 asylum seekers to Poland. NGOs and human rights groups are less impressed. Marta Górczyńska from the Helsinki Foundation said the planned changes in the asylum law were “concerning” because they could lead to “a systematic violation of rights of asylum seekers enshrined in the Geneva Convention of 1951 and EU law on asylum.” The foundation fears toughening up border procedures could see asylum seekers being detained. In March, Hungary decided that asylum seekers would be held in detention camps and housed in converted shipping containers. Hungary, a close ideological ally of Poland’s right-wing government, has been on the forefront of taking a tough approach to migrants and asylum seekers. 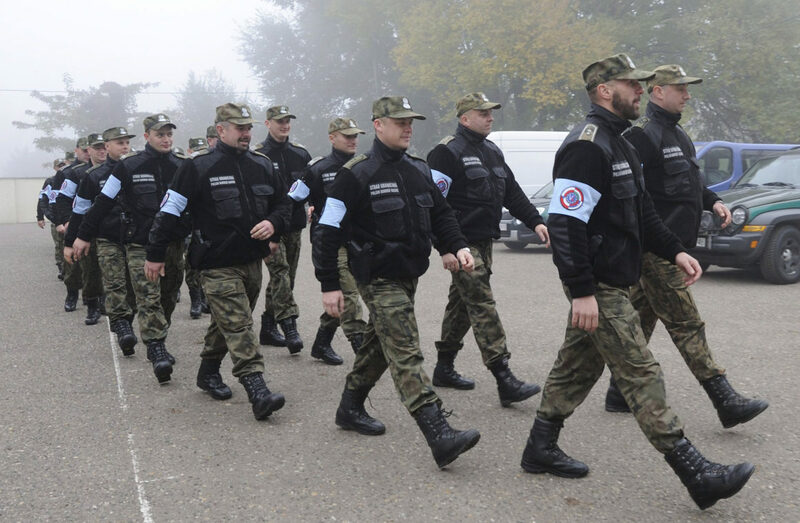 The country bore the brunt of the 2015 migration crisis when hundreds of thousands of people passed through the Balkans on their way to Germany and Western Europe. After winning the election, PiS pulled out of an agreement the previous government had made to relocate some 7,000 asylum seekers to Poland. Like Hungary and Austria, Poland has to date relocated no refugees through the EU’s refugee scheme, though Vienna recently announced a change of policy. “We have no terrorist attacks in Poland because we withdrew from a plan approved by the previous government of accepting thousands of migrants, known as refugees,” Błaszczak told TVP Info last week. I believe this case study is very interesting, as we usually talk about branding strategies for consumer goods and service companies. But anything can need a branding strategy, from a human being (which is called personal branding) to an entire country! Branding a country can help attract tourists and investors, and increase the demand for what the product has to offer (for example, product and services). Also, good branding can help the country earn the respect of other nations. The country needed a strong and positive country brand that stood out, drew attention, and was able to transmit a clear promise. The objective was to create acompetitive advantage for the country to gain international exposure (such as tourism and exports), but also to attract investors. The new brand identity was built around Peru’s flavors, colors and living history. It was built to attract more tourists to both the new and the modern Peru, mirroring all its beauty, diversity and generosity. “Peru is now an international destination that offers attractions and opportunities that are unique in the world, due to its natural and cultural treasures.”, explains branding agency Futurebrand on its website. The brand needed to be used within a variety of sectors (tourism, gastronomy, investments…), which is why the agency decided to keep the brand’s name simple. The entire identity was built around the word “Peru” and no frills were added to the name. The red color chosen for the logo is a reflection of the intense and vibrant red on Peru’s flag, which represents the dynamic culture and people of the country. Because the country possesses different facets and aspects, the brand identity design could not just rely on the color red, and was also built upon a multi-colored palette. The colors symbolize the diversity of Peru’s regions and landscapes, and its energetic and stimulating character. The graphic design line was inspired by the different regions and cultures. The photographs chosen to promote the country are traditional images of Peru, but also include the addition of flowing lines which follow along the contours of key elements in the photographs. This design connects the images to the overall look of the campaign, and also sets the photographs apart from simple stock images, which are often chosen for destination brands. Peru now has a very memorable brand that tells the world how culturally rich the country is. We like that the branding strategy shows a true connection between the brand and the country. When Dr Hastings Kamuzu Banda and his Malawi Congress Party (MCP) took power in 1964, the role of the youth in politics became evident: They became his ‘eyes and ears’, quashing all of his real and imagined enemies. The youth became instruments of fear. Through the Malawi Youth League, also known as chiswe (termites) for their red uniforms and the Malawi Young Pioneers (MYP), the first Malawi leader instituted a reign of terror to silence his political opponents. Even classes were disturbed whenever the President went out of the Sanjika Palace to tour crops, receive international guests and perform other engagements. The learners were forced to line up the streets and clap hands and sing praise songs for him. During preparations for Independence Day and the Kamuzu Day celebrations, some learners were taken off classes to participate in his propaganda youth rallies. In 1994, with the coming of Bakili Muluzi and his United Democratic Front (UDF), the hope was things would change. That, however, was not to be as his Young Democrats (YDs) were engaged in beating up political opponents. At some points, some lost their lives. As a matter of fact, some YDs such as Charles Waya, who was involved in the torching of then opposition leader in Parliament Gwanda Chakuamba’s official vehicle died mysteriously when it was discovered he was double-crossing the two parties. His body was not found in his purported unmarked grave near Stella Maris in Blantyre during an inquiry by the Ombudsman. The story remained the same when Bingu wa Mutharika took over the reins of power in 2004. His Youth Cadets continued from where the UDF youth cohorts stopped. 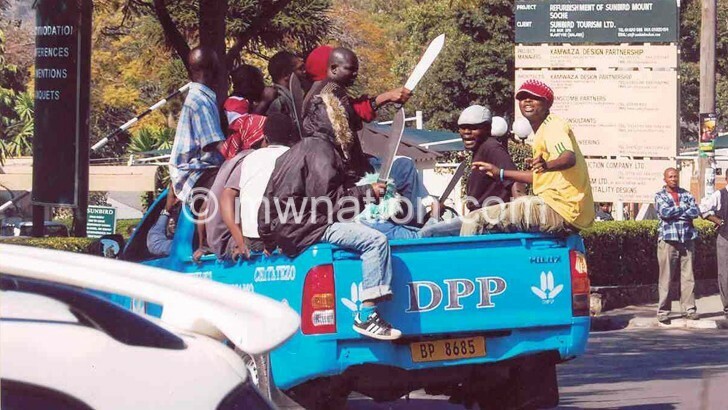 A day before the July 20 2012 demonstrations against the Mutharika regime, the cadets were seen in DPP vehicles, brandishing panga knives to keep Malawians off the streets. Although Joyce Banda’s youth tried to change the face of youth participation in politics, they, too, were involved in their own violent acts. A case in point was when Peter Mutharika’s aide Ben Phiri and DPP stalwart Nicholas Dausi were roughed up at Sunbird Mount Soche in Blantyre. Some of the youth were used to add flare, like the DPP youth, by painting their faces and bodies in party colours. Over a year in power, Peter Mutharika’s DPP youth have carried on the painting of faces and bodies to symbolise their loyalty to the party. A United Nations Development Programme (UNDP) and the UN Focal Point on Youth say there is strong evidence that the participation of young people in formal, institutional political processes is low when compared to older citizens across the globe. This challenges the representativeness of the political system and leads to the disenfranchisement of young people. It is further noted that youth engagement in the political arena is a new priority. “People under the age of 35 are rarely found in formal political leadership positions. In a third of countries in the world, eligibility for the national parliament starts at 25 years or higher and is common to refer to politicians as young if they are below 35 or 40 years old,” notes the fact sheet. In a 2012 UN survey, 13 000 respondents from 186 countries highlighted that the main challenge for young people’s active and meaningful participation in their societies’ decision-making processes is limited opportunities. It is no different in Malawi, stakeholders agree. National Initiative for Civic Education (Nice) regional civic education officer for the centre Chris Naphiyo would have it although the youths are used in violence and being painted in party colours, they do not understand the political ideologies of their parties to fully engage in civics. “Mostly, they paint themselves in political colours and sing for the leaders just because they are given money by the leaders. One wonders whether this is what it means by youth empowerment,” says Naphiyo. According to him, there is a lot the youth should be doing to participate in governance and political issues instead of what is happening. “There is so much they can do, instead of painting themselves and dancing for politicians, let alone engaging in violence. That is not how best they can contribute to their political parties,” he adds. Naphiyo says youths should participate in governance issues starting from decision making level such as local governance. Concurring with Naphiyo, Malawi Human Rights Youth Network (MHRYN) president Kingdom Kwapata says political parties and stakeholders should find something better for the youths rather than engage them in touchline politics. He further agrees the search for money is the drive, as the youth mostly lack income-generating activities to keep them off petty politics. He says there is need for Malawi to come up with many ways of empowering youths economically. “Empowering the youth with education and help them become entrepreneurs or artisans when they fail to make it in other forms of employment. Unemployment will be reduced and no youth will be willing to paint his or her body just to get little money from political leaders,” says Kwapata. For president of Young Politicians’ Union Charles Makuwa, the constitutional framework has not helped increased youth civic and political engagement. “We thought by now Malawians would have fully understood what youth participation is all about. We still lack youths in leadership positions because old people still cling to different positions in our political parties,” says Makuwa. Makuwa blames the Constitution of the Republic of Malawi, for instance, for stating that one should be 35 and above to vie for presidential position during national elections. Although the constitution sets the minimum legal age to contest for the hot seat, it has no age limit, a president aged over 80 can lead a civil service whose retirement age is 60. “Malawi is still behind in as far as accommodating youths in leadership positions is concerned. Our constitution also frustrates youths. There are many capable youths who are doing well in entrepreneurship, civil society and other professions. However, they cannot vie for the presidential position because they are below the constitutionally acceptable age of 35,” complains Makuwa. He calls for stakeholders to consider this ‘anomaly’ when they engage in constitutional review in future. PP spokesperson Ken Msonda believes the abuse of the youth in politics roots from the way Malawi brands politics. “Instead of being the science of running a country, we take it as a game of pulling each other down. Politicians must serve the nation, that is why youth involvement is vital. It is high time they were accorded their legal needs,” observes Msonda. His UDF counterpart Ken Ndanga says the youth are ‘an important resource’ not only in politics, but to the country as a whole. “Of course, we have had problems with the youth as a party. Basically, it’s all about the youth knowing what they can contribute to society rather than wait to be told what to do. They are vulnerable. The big-wigs tend to see the youth as a threat and as such, they usually want to use and, at times, abuse them,” asserts Ndanga. According to him, The youth have to start demanding programmes that can benefit them. Both Nice and MHRYN have deliberate programmes to drill youths with leadership skills so that they know the productive way of participating in governance issues.